Waste management is the collection, transport, processing or disposal, managing and monitoring of waste materials. The term usually relates to materials produced by human activity, and the process is generally undertaken to reduce their effect on health, the environment or aesthetics. Waste management is a distinct practice from resource recovery which focuses on delaying the rate of consumption of natural resources. The management of wastes treats all materials as a single class, whether solid, liquid, gaseous or radioactive substances, and tried to reduce the harmful environmental impacts of each through different methods. Rapid industrialization last few decades have led to the depletion of pollution of precious natural resources in India depletes and pollutes resources continuously. Further the rapid industrial developments have, led to the generation of huge quantities of hazardous wastes, which have further aggravated the environmental problems in the country by depleting and polluting natural resources. In fact, man today is caught in the vicious circle of increasing wants, declining resources and increasing waste being generated by the industries and municipalities is posing a problem of enormous dimensions. The domestic and industrial effluents are contributing in enhancing this problem. It might become the biggest problem if it is not dealt with immediately. Therefore, rational and sustainable utilization of natural resources and its protection from toxic releases is vital for sustainable socioeconomic development. Hazardous waste management is a new concept for most of the Asian countries including India. The utilization of resources and generation of waste is for beyond the limit that the biosphere was made to carry. modern technologies for water pollution control, water recycle & product recovery air pollution control, environmental management system (EMS), surface active agents and contamination of water, physical methods for the treatment of organic acid bearing wastes, realities of waste cyanide treatment in India, biological treatment of aqueous wastes, plastics and generated wastes, alginate industry waste a source of biogas, acid charred waste as a resource material for highly active adsorbent. We have made a sincere effort to bring out this book which helps in minimizing the problem. For the conservation of our environment and sustainable development, we have tried to bring about the solution. This book is a careful attempt in bringing together some selected articles from both entrepreneurs and specialist on all that is possible in the field of waste management. 46. Leading Environment Consultants in U.S.A. The term industrial waste is generally understood to refer specifically to the liquid waste produced as a result of some industrial operation, as distinct from an industryâ€TMs solid refuse or its gases, fumes and vapors. Like municipal sanitary sewage, most of suchliquids must ultimately be disposed of into rivers or other water courses. The liquid wastes of a community, whether domestic sewage or industrial wastes, should receive appropriate treatment before discharge into streams in order to prevent gross pollution. The treatment methods for domestic sewage are based on a fundamental and growing body of knowledge. These methods, however, are not suitable for industrial wastes, which are quite varied in character. Frequently anew industrial process development will produce a waste that is not amenable to treatment by any of the conventional methods. For such wastes, laboratory investigations followed by pilot-plant studies must precede final design of treatment works. According to a 1998 survey, 70 million persons in India live in communities served by sewerage systems and the number of persons so served increase more rapidly than the national population. In the same year, the population equivalent of the nationâ€TMs industrial wastes on the basis of organic strength of the waste was estimated to be 55-60 million people. This comparison does not fully express the magnitude of the industrial wastes problem. Many constituents of industrial wastes without counterpart in domestic sewage are not represented by the â€œpopulation equivalent.â€ Yet many of these constituents are responsible for the most detrimental effects of industrial wastes. The volumes of process water per unit of manufactured product are generally well known. Except for some rinse and cooling waters that may safely be discharged Into storm sewers, most process waters end up as a waste requiring specialized treatment and disposal methods. The volume of waste, together with its composition and concentration, is the measure of each particular problem (see Table 1). Broadly stated, pollution of streams with Industrial wastes degrades the physical, chemical and biological qualities of the receiving waters. This degradation gives rise to a variety of economic problems that are the concern of all communities and industries downstream from the point of pollution. The most apparent of these problems is the damage to the quality of the stream and its fitness for subsequent domestic and industrial use. Depending on the character of pollution material, this damage may take the form of increased concentration of hardness and encrustants in greased colourand turbidity. Increased corrosiveness, increased concentration of taste and odor-producing substances, and dangerously high concentration of toxic substances. In extreme pollution such as in the Merrimac and Raritan rivers, the pollutional load in some sections has risen to levels that will not permit the use of the water for municipal or industrial purposes. In less extreme instances of pollution, existing water purificatton plants are unable to remove enough of the increasing pollutional load to produce satisfactory water. This has been notabty true with respect to taste and odor-producing substances. The second type of problem resulting from industrial pollution is the changes produced in the biological balance of the receiving stream. These may come about because of siltation and the laying down of sludge blankets over spawning beds: they may result from a marked shift in the pH of the water: they may be due to a lowering of the dissolved oxygen content of the streams, or they may be due to cumulative toxic effects of certain pollutants. In extreme cases, such changes drive out or kill off the normal biological fauna and exhaust the capacity of the stream for self-purification. In these latter cases, the effects of the industrial pollution will be felt for downstream from the point of pollution: they may extend down to tide water and destroy a thrtving shellflsh industry. It is this aspect of pollution problems that receive the attention of the fish and wildlife interests. Such changes also cause a loss of recreational assets of downstream communities. Inincreasingly populous and industrialized areas, boating, swimming, camping, and the like become rarer pleasures, and natural facilities for such outdoor sports take on increasing importance in the conservation movement. Loss of property values results downstream from points of severe pollution. Under common law and the reasonable use rule, riparian owners are entitled to recover damages for such losses. Beyond the individual owner, however, there is the cumulative loss to the community of declining property values. Finally, the relationship between an industryâ€TMs waste and the receiving stream and the costs of the intervening treatment required have a marked effect on industrial operations. It is one of the factors that enters into site selection for new plants or the enlargement of existing plant facilities and capacity. Ultimately the cost of industrial waste treatment is apart of the cost of production. When waste treatment costs mount to the point that they represent a sizable fraction of production costs, the resultant product may be in a poor competitive position. Industrial wastes can be classified according to the biological, chemical, and physical properties that may contribute to degradation of receiving waters. Although it is not always possible to translate properties of waste into terms of effects on receiving waters, for purposes of classification the properties are treated as if the pollution potential of a waste is either directly proportional to the intensity of its components or represented by a designated standard test. The numerous properties possessed by some Industrial wastes may require their inclusion in several classes. Biological Properties. Biologically Oxidizable Material Discharges containing material that can be oxidized when utilized as substrate by bacterial flora are classified as biologically oxidlzable. Dissolved oxygen presentin natural waters serves as the source of oxygenfor this process. The vast majority of industrial wastes are classed within this group. Wastes that may undergo biochemical oxidation are sometimes termed â€œorganicâ€ wastes, since many organic compounds are readily oxidized through biochemical action. In this definition the term â€œorganicâ€ is inexact because organic compounds differ widely in their susceptibility to biological decomposition and some inorganic substances, such as ammonia, are subject to biochemical oxidation. The pollutional potential of these wastes containing significant amounts of biologically oxidlzable materials is usually evaluated from a standard 5-day biochemical oxygen demand (BOD) determination. Examples of wastes in the organic pollution group are those from dairies, distilleries, pharmaceutical houses, canneries and pulp and paper industries. Pathogenic and Indicator Organisms. Discharges which may contain pathogens or saprophytes commonly employed as indicators of contamination such as organisms of the coliform group are included in this category. Wastes from slaughterhouses and tanneries are examples of wastes that might be classed within this group. Chemical Properties. Toxic Substances. Discharges containing substances that interfere directly, or through synergistic action, with the native aquatic population of receiving waters may be classed as toxic wastes. Exhaustive studies are required to evaluate toxicity in quantitative terms. Many of the existing standards pertaining to toxicity are of an empirical nature. Examples of toxic substances present insome industrial wastes are acids, alkalies, cyanides, salts of heavy metals, sulfides, fluorides, and phenolic compounds. Toxicity is frequently associated with wastes from metal finishing industries, coke and gas plants, petroleum refineries and tanneries. Salinity and Hardness. Discharges containing relatively high concentration of salinity and or hardness can impair the quality of lower riparian potable water supplies. Examples of wastes that may fall within this classification are oil field brines, acids, alkalies, mine drainage and brine from ion-exchange units. Acid wastes, such as those from steel pickling and coal mining drainage that contain only inorganic compounds and no toxic metals, may have serious effects on the biota of a stream because of the lowering of the pH. By reducing or stopping the natural self-purification processes in a stream, these wastes retard the biological stabilization of accompanying organic wastes, and the pollution effects are extended farther downstream. Physical Properties. Temperature. Discharges that alter the temperature of receiving waters to an extent sufficient to Interfere with the native aquatic population may be classedas temperature pollutlon. These wastes Include condenser discharges and boiler blow-down. Films and Scum. The presence of a separate phase floating on the surface of a watercourse Indicates film or scum pollution. Such conditions are frequently produced following discharge of waste containing solvents, oils or greases. Turbidity: Discharges that increase the optical density of receiving waters by virtue of the presence of fine suspended material (usually colloidal) can be classified as turbidlmetric pollution. Turbidity is deter -mined from a measurement of optical density. Examples of this type of discharge are those from hydraulic mining operations, coal washeries, carbonization of coal, and petroleum refineries. Suspended Solids: Discharges that contain undissolved solids, or that through interaction with constituents present in natural water result. In the formation of Insoluble solids, can be classified as suspended solids pollution. Suspended solids are separated by filtration through a gooch crucible and determined gravimetrically. Examples of wastes containing suspended solids are those from coal washeries, pulp and paper mills, metal picking processes, canneries, and wool scouring. Color: Discharges that Impair the natural color of receiving waters are classified as color pollutants. The character and intensity of color are evaluated from standard optical density determinations over the visual waveband of the spectrum. Examples of colored wastes are those from dyeing operations, canneries, and from chemical and explosive manufacture. Taste and Odor. Discharge that impart taste or odor to receiving waters or that contribute to taste or odor in lower riparian potable water supplies are classified as taste and odor pollution. Substances such as phenolic compounds, solvents, petroleum products, and reduced sulfur compounds can impart taste and odor to water although presentin minute concentrations. 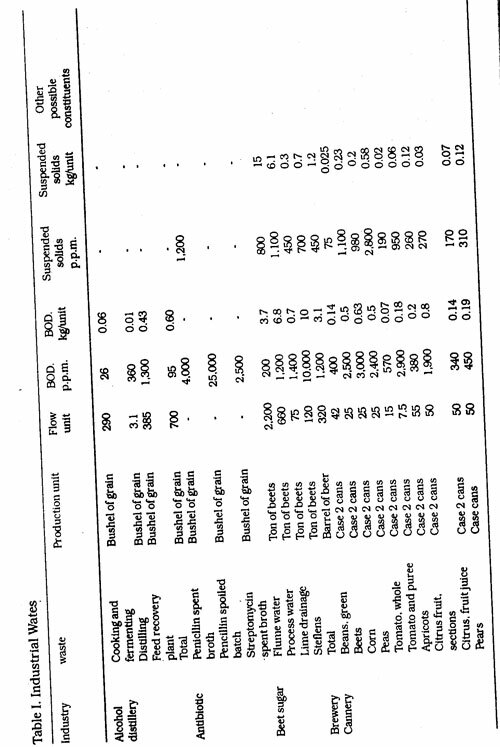 Acomparison of industrial wastes is presented in Table I. Industrial wastes vary from time to time and from plant to plant; hence, the values presented are Intended to be indicative of the general expected order of magnitude. Broadly stated, the plan for handling a particular waste alms at: (I) minimizing the total volume and concentration of waste produced, (2) recovery of potentially valuable fractions of the wastes for re-use or byproduct development, and (3) most economical treatment of the remainder, consonant with water resource conservation. The methods employed fall Into the following categories. Reduction of Volmne of Waters. A careful analysis of the points in an industrial process at which water is used will frequently reveal economies that can be effected without sacrifice of product quality. The elimination of leaks in water piping or unnecessary use of water, more efficient use of water through counter-current washing tanks, and reuse of batch solutions that can be made up to required strength are typical of methods that reduce the cost of water employed in a process and simultaneously reduce the cost of treatment of the resultant waste. Cooling and condensate waters should also be segregated from process waters for separate discharge if they are of sufficiently good quality to justify such discharge, and their quantity is great enough to justify the added cost of separate collection. Water Recovery. In some Industries, certain fractions of the waste have been found to contain materials that can be recovered. Calcining of lime sludges, recovery of caustic soda from wastes from the kiering of cotton cloth, and recovery of oil from wastes are examples. Usually the cost of recovery is somewhat more than the cost of equivalent fresh material but the concomitant reductionin cost of waste treatment Justifies such recovery processes. By-product Recovery. Materials recovered from a waste are frequently not good enough In quality for reuse but may be recovered economically for by-products, as illustrated by segregation of skim milk, butter milk, and whey from milk industry wastes, the conversion of blood and paunch contents from slaughter houses Into fertilizer, and the production of animal feed from brewery and distillery wastes. Again, althoughthe value of the by-product alone may not justify the cost of recovery, the reduction in cost of waste treatment needs to be taken into account. Segregation of Waste. In a large industrial plant there may be several classes of waste varying In volume, strength, and toxtcity. One may be readily amenable to biological treatment with domestic sewage, another may be quite inimical to such processes, and another may have value for by-product recovery. Careful study of their characteristics may indicate that each waste should be handled and treated separately. Thus at a plant making woollen blankets, the wool scouring waste may be processed by acid-cracking or centrifugatlon to yield wood grease before allowing it to become mixed with waste dye batches. It is especially necessary that any toxic wastes be segregated. All such segregation requires careful planning of separate plant sewer systems. Neutralization. In many industrial processes operating onabatch basis, the production of wastes is not uniform in time but is necessarily discharged to the plant sewers periodically in â€œslugsâ€. Where somebatches are acid and others are alkaline, or where some contain reducing agents and others oxldants, a beneficial self-neutralization may be effectedif the wastes are pooled over a 24 hour or preferably longer period. This requires the provision of a detention basin of capacity equal to the volume of waste produced during the pooling period. Because thermal or density stratification may limit thorough mixing and neutralization, some form of mechanical mixing Increases the effectiveness of the basin. Diffused air aeration is excellent for this purpose since it generates turbulent mixing, prevents sedimentation of suspended solids, and supplies dissolved oxygen to wastes that would otherwise become septic during the detention period. In addition to centralization, detention and mixing over an adequate period produce a waste of relatively uniform composition. Equalization of Flow. Detention tank also provide the means of regulating the flow of wastes to the treatment works. Biological treatment works operate at much higher efficiencies when the rate of flow and the composition of the waste are constant Where mixed Industrial wastes are released from detention tanks to municipal sewers for dilution and treatment with domestic sewage It is often desirable that the release rate be proportional to the flow of domestic sewage. Thereby uniformity of dilution of the waste in the sewage is achieved and more efficient treatment can be effected. Complete Treatment. Industrial plants so located as to be inaccessible to municipal sewers should provide suitable treatment of their waste before release to a receiving stream. Moreover, municipal sewer entrances may regulate the type of wastes that are admissible into the sanitary sewer system and may exclude those that are Inimical to combined treatment with domestic sewage. Industrial plants producing wastes that are thus excluded may be required to provide suitable treatment before release to a receiving stream. Partial Treatment. Short of absolute exclusion of certain Industrial wastes from municipal sewers, local ordinances may require that industries provide partial treatment of wastes so that the resultant treated effluent can be handled in combination with domestic sewage. Treatment with Domestic Sewage. Many industrial wastes can be more effectively treated in combination with domestic sewage than alone. This is the case where the Industrial waste lacks nutrients suchas carbon, nitrogen, and or phosphorus essential for bacterial nutrition. Domestic sewage, because of its heterogeneous composition, will provide these essentials, provided the ratio of industrial waste lacks nutrients such as carbon, nitrogen, and/or phosphorus essential for bacterial nutrition. Domestic sewage, because of its heterogeneous composition, will provide these essentials, provided the ratio of industrial waste to domestic sewage is not excessively high. The following discussion of specific treatment methods reviews more specifically the range of these methods with illustrations of typical wastes with which they have proven effective. No in-plant Pre-treatment. The discharge of industrial wastes into municipal sewers in most instances is the most satisfactory method of disposal, particularly where the wastes require treatment before they can be discharged into a stream. However, unless satisfactory financial arrangements can be made and the industrial wastes received in a manner in which the treatment plant can handle them, those responsible for theoperation of a municipal disposal system cannot be expected to subscribe to the general statement made above. The minimum Pre-treatment required is that necessary to render the waste harmless to the sewerage system, the plant operation, and the receiving stream. This minimum pre-treatment should include: (1) removal of materials that will clog the sewers, either by sedimentation or deposition on the sides, such as grit, sand, pulps, greases, and tars; (2) removal of materials such as acids and abrasive, that may damage the sewage collection and treatment structures; (3) removal of hazardous wastes, including volatile, flammable or toxic materials; (4) removal of toxic materials that will appear in large enough concentrations to affect the sewage treatment process or the receiving stream; and (5) removal of materials that will exceed the treatment capacity of the sewage plant and impair its efficiency or pre-empt its capacity in an inequitable manner. In addition to these minimum conceivable pre-treatment requirements, additional treatment may be needed to meet the standards of waste quality set by the municipality. Pre-treatment can often be made unnecessary or be kept to a minimum if certain in-plant precautions are taken to minimize the effect on the sewerage system or treatment plant. Many precautions apply not only to discharges into sewerage systems but also to any Industrial waste problem. These include: (1) equalization of waste load preferably measured by the weight of BOD or suspended solids discharged per unit of time; (2) equalization of flow compatible with equalization of load; (3) storage and mixing as necessary to equalize loads, to permit interaction of wastes (such as acids and alkalies, oxtdants and reductants), and to effect dilution of highly toxic materials (such as cyanides, aniline, and phenols); (4) separation of special highly concentrated or toxic wastes for disposal by means other than discharge to sewers or for individual pre-treatment; (5) reduction of waste load by improved product handling, better in-plant housekeeping, and special employee training for waste control and reduction; and (6) reduction of waste load by process changes and manufacturing techniques specially designed for waste control. Equalization of waste load, particularly with biological sewage treatment methods is one of the most important requirements if pre-treatment is to be avoided. The amount of equalization necessary will depend upon the relative sizes of the industrial waste load and the total load received at the treatment plant. For example, a large dairy (300,000 It of milk per day) in a very large municipality (1 million population) should be able to discharge its wastes, including the whey, intermittently without adversely affecting the sewage treatment plant because of the large dilutionratio and the long travel time of the sewage. On the other hand, a small dairy (20,000 Ib. of milk per day) in a small city (10,000 population) would probably be required to equalize the discharge carefully and might be prevented from dumping the whey. Although equalization of waste load over the entire 24hours is considered desirable, sometimes controlled discharge during the off-peak hours at night can be advantageously used. Such practice is generally limited to small or medium-sized systems where flow period are relatively short and the industry is relatively large. Although these special equalization methods require good co-operations between the industry and the municipality, and careful control, their mutual advantages to both the industry and municipality are obvious. With in-plant treatment. If an industrial waste cannot be modified enough to meet the specifications set by the municipality short of using techniques of treatment which were previously discussed, then pre-treatment of the waste is necessary. The amount of pre-treatment desirable is usually only enough to permit the waste to be discharged. Even when special charges are made for handling industrial wastes, it is generally unlikely that the industry can treat the waste at less cost than the municipality. Thus it is not economical to provide more pre-treatment than is actually required, except under very unusual circumstances. Pre-treatment can be divided into three general categories, physical, chemical, and biological. Physical pre-treatment is generally limited to fine screening, settling and skimming, and is used mainly to remove materials that would clog sewers, impair operations of treatment plant units or machinery, or be a hazard because of their volatility. Screening is most successfully applied to the removal of organic solids such as those occurring in canning and papermaking operations. In canning practice, 40,50-meshvibrating screens have gained wide acceptance, while for fibrous solids, such as those in paperwastes, rotaryscreens of 60-80 mesh with liquid flow from the outside of the screen to the Inside are considered superior. Fine screens should provide for continuous mechanical removal of the screened solids, be self-cleaning as far as possible, should require a minimum amount of supervision, and is rugged enough to run continuously without excessive maintenance. Service that do not have these qualities can only be considered as makeshift or temporary expedients and will not perform satisfactorily. Setting (Pre-treatment): Sedimentation is most frequently used for removal of heavy solids such as grit which will settle out in sewers. Elaborate mechanically cleaned grit chambers may be employed where the amount and character of the material warrant their use. Many Industrial waste grit chambers are merely tanks or pits that act as combined mixing, equalization and grit-removal devices. Periodic cleaning is required but their use is often satisfactory for removal of moderate quantities of grit from Industrial wastes that do not have settleable organic solids. Mechanically cleaned sedimentation chambers for the removal of settieable solids are rarely used ahead of municipal sewers because the removal of such material is not generally required, nor is it economical to do so. Certain situation may dictate pre-treatment by sedimentation for removal of settieable solids, such as recovery of valuable materials, removal of precipitated toxic metals, and protection of an overloaded sewage treatment plant. Sedimentations is often practiced in conjunction with lagooning prior to discharge into sewers. In such Instances the settled solids are usually an unwanted by-product of lagooning, which is generally used for flow and load equallzation mixing and chemical interaction. Lagoons are effective for such purposes, but their practicability is often influenced by sedimentation and sludge removal problems. Skimming on flotation is often referred to as â€œreverse sedimentation. â€œWhere oils, greases, or other floatable materials that should be excluded from sewers are to beremoved by pre-treatment, a tank, lagoon, or special flotation device is required. Where the floable materials are not excessive, a single baffled outlet on a sedimentation tank or lagoons is all that is required. Skimming can be by hand or semiautomatic through some type of surface draw-off device. Where floatable materials must be continuously removed in significant quantities, mechanically skimmed sedimentation tanks, oil separators, or special flotation tanks should be used. Although skimming devices are often simple to construct, special attention should be given to their use because of the hazards involved, principally from fire. Since oil or other flammable products are usually involved, fire problems must be considered. Although enclosed skimming devices reduce the fire hazard, they are more difficult to clean and maintain and are likely to be left unattended and forgotten. Unless enclosed units have an easily operated and controlled skimming arrangement and proper facilities for easy Inspection, they cannot be counted upon to perform satisfactorily. Chemical pre-treatment before discharge into sewers covers a wide range of problems, but most these fell into three general categories: neutralization of acids or alkalies, removal of oxidants and reductants (principally reductants), and removed or change of toxic constituents (for example, cyanides and heavy metals). Where chemical pre-treatment is required, flow equalization and waste mixing are often advantageous and in many instances necessary. Sometimes this is all that is required because sufficient chemicals occur in the total waste to effect the necessary neutralizations or other desirable reactions. When further treatment is required, prior equalization simplifies the control of the treatment process and saves chemicals. Usually neutralization of acid is the problem, and since lime and limestone products are the cheapest virgin alkaline materials, they are most often used for this purpose. Since sykfyruc acid is the most prevalent waste acid, neutralization problems arise when limeis used for neutralization because of the relative insolubility of calcium sulfate. Calcium sulfate sealing problems can be reduced by the use of dolomltic lime and by control of the sulfuric acid concentration of the waste. Crystal seeding with gypsums crystals or previously precipitated calcium sulfate also has been shown to control scaling and reduce the volume of sludge produced. Upflow limestone beds provide a simple economical means for the neutralization of waste acids. With sulfuruc acid their use is limited to dilute acid ranges because of calcium sulfate precipitation on the limestone particles, which Inactivates the bed. 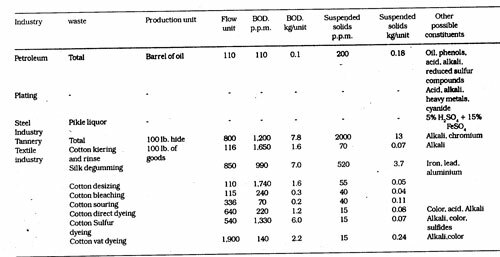 Sulfuric acid concentrations of over 2,000 p.p.m. may cause difficulties, and 5000 p.p.m. is about the upper limit for upflow beds. Excess sulfate or calcium ions in the acid waste will reduce these limits because these ions will reduce the solubility of the resulting sulfate. Alkalies offer fewer problems for disposal into sanitary sewers because they do not attacksewer structures, and often all that is required is simple equalization of discharge. Where neutralization is required, sulfuric acid is usually employed because of its low cost. Waste flue gas has also been used in special instances, but the low cost of the neutralizing agent (carbon dioxide) is partially offset by high Installation costs. Oxidizing and reducing agents in industrial wastes can cause problems when discharged into sewers. Since sewage itself contains many reduced, compounds, oxidizing agents are not generally as troublesome as reducing agents. Usually equalization of flow and load, or storage and mixing with reducing substances discharged in the waste, will solve most problems. When such measures fall, segregation and separate disposal, or treatment with some reducing substance such as sulfite, blsulfite, or even sulfide may be necessary. Unless the oxidizing substances interferes with the sewage treatment process, there is no reason for reducing it by pre-treatment. Since one of the chief alms of sewage treatment is to raise the oxidation level, an oxidant may be a help to the process if it does not appear in such high concen trations as to be dangerous orbiologlcally toxic. Reducing agents on the other hand are quite troublesome when discharged into sewers, even though they are not generally considered toxic to biological life. Reduced compounds add to the oxidation requirements of the treatment process, lead to conditions that give rise to odors and other nuisances both in sewers and at the treatment plant, and make disinfection by chlorine difficult and expensive. Reductants can be pretreated in much the same manner as oxidants except that any chemical treatment must be used in a reversed manner. Reduced sulfur compounds both inorganic and organic are most frequently encountered. Because so much oxidation is required to treat sulftdes adequately either chemically or biochemically, these compounds are often removed by acidification followed by scrubbing with caustic solutions. Oxidation by chlorine or some other chemical codding agent is frequently used. The speed and simplicity of operation and the completeness of oxidation makes chlorine a good treatment for wastes containing reduced compounds. The cost of chlorine is often an important factor, and it may offset the advantages. This is particularly true for highly reducing compounds such as sulfldes which use almost 9 p.p.m. of chlorine for each p.p.m. of sulfide oxidized to sulfate. Simple aeration is also frequently effective for removal since both oxidation and scrubbing actions are Involved. One disadvantage in many treatment operations for removal of reduced substances is that a water pollution problem becomes an air pollution problem. Biological Pre-treatment. Toxic substances can be troublesome when received sewage plants because many systems rely on biological methods for their treatment. Even though no biological problems are involved at the plan, the receiving streams may be affected by the discharge of toxic substance. Again, equalization of flow and toxic load or segregation and separate disposal of major offending wastes may be all that is required to solve toxicity problems. Pre-treatment methods are similar to those used in regular Industrial waste treatment practice. Chemical and biological pre-treatment to reduce the solids and BOD load discharged to sewage systems follows much the same pattern and methods as full industrial waste treatment, except that the treatment need not be as complete and the resulting sludges do not have to be separated but can be discharged with the total waste for subsequent removal at the sewage treatment plant. Some toxic substances, such as copper, must be removed by precipitation, setting, and sludge removal before discharge into sewers. This is because of toxlcity to sludge digestion processes at the sewage treatment plant. This requirement will not be necessary if biological methods are not used for sludge disposal. After all efforts to reduce waste flows and total waste loads have been made, it is than proper to consider the waste treatment problem remaining and the practical solutions. Physical, chemical and biological processes are available, but often combinations of these processes are required. Physical methods include screening, setting and flotation. Another physical process that often warrants consideration is controlled dilutionby which wastes are stored in lagoons during periods of low stream flow and discharged to the stream during high flow when adequate dilution is available to prevent downstream nuisances. Although this method of waste disposal may seem crude, a property designed waste disposal operation using controlled dilution is often the best and most practical solution. Sedimentation. Plain sedimentation is used forremoval of settleable material, and the methods and equipment employed are similar to those used for sewage treatment. Industrial waste practice uses more upflow and sludge-blanket-type sedimentation basins than sewage practice because these units are better adapted to the handling of wastes containing higher solids concentrations and producing more voluminous sludges than are ordinarily encountered in sewage disposal practice. Mining and papermaking are examples of industries in which sedimentation is a major portion of the waste treatment processes. Chemical Treatment. The type of chemical treatment discussed here pertains to its use as as a sedimentation aid for the coagulation of nonsettleable solids. Alum and ferric iron salts such as ferric chloride, chlorinated copperas, and ferric sulfate are widely used as coagulants, particularly in the acid range pH 4.5-6.5. Iron salts are also effective in the alkaline range pH 8.5-10.5. Lime is usually employed in conjunction with the iron salts for alkaline coagulation. Ferrous iron is also an effective coagulant in this pH range, and lime and copperas are often used together. Although the ferrous ion is not considered as effective as the ferric ion, the cheapness of copperas (waste product from steel pickling, and titanium or processing operations) makes its use with lime an economical and effective coagulant. Lime alone is a good coagulant for many wastes, and although the effluent is not always as clear as that obtained with other agents, the low chemical cost and smaller resulting sludge volume produced warrants consideration for its use in many chemical treatment operations. Alum is not considered good with alkaline coagulation because of the large floes produced and the fact that aluminium begins to go back into solution about pH 8.5. Sodium aluminate has been used successfully at these higher pH, ranges. (Copperas is a name given to ferrous sulfate; chlorine is often added to the solution to oxidize iron to the ferric state). With chemical treatment, it is important that pH control, chemical dosage, and flocculation time tobe given careful consideration if economical operation is to be realized. Many relatively small chemical treatment operations are more concerned with simplicity of control and achieve good results and manpower savings by using excess coagulant at the expense of coagulant efficiency. Lagoons are also effective sedimentation devices and have an important place in the industrial waste treatment field. Many of the objectionable features of lagoons, can be overcome with careful planning. Important advantages of lagoons include their unusually large sludge holding capacity, their ability to handle large flow variations, their long settling period, and their low cost. Flotation methods can be divided into two general categories, those that employ simple flotation and those that employ air bubbles to make solid materials floatable. 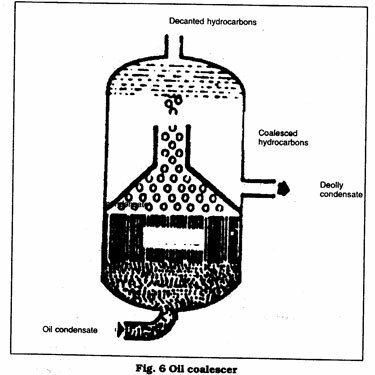 Oil separators are typical examples of the first type. Often simple settling is also provided for in the separator with mechanical equipment to remove both settled and floated materials. Air flotation units are most widely used in the paper industry for waste treatment because of their early application to paper waste treatment and primarily because paper fibers are subject to rapid flotation. Flotation units are generally much smaller than sedimentation units for treating comparable flows. Detention times in flotation units are often 15 minutes or less, particularly with paper wastes. Air flotation is seldom used alone, a coagulant such as alum or lime usually being employed to form large enough aggregation of particles to permit their rapid flotation. Flotation units are best adapted to the separation of solids that are either light and fibrous, such as paper fibers and some cannery waste solids, or to grease like materials that canbe coalesced. Flotation of grease like materials may be facilitated by the entrainment in the surface film of finely diffused air bubbles. The other type of chemical treatment is concerned with the use of chemicals to bring about a chemical change in the waste constituents either to permit their removal or to convert them into less objectionable forms. Some of the problems concerned with this type of treatment have been discussed. Because of the great variation in the chemical constituents of wastes, it is impossible to give many details conceming treatment. Certain treatment operations can best be handled on the concentrated wastesbefore dilution with wash waters, and general plant wastes. With these concentrated wastes, chemical treatment operations are often similar to plant processing operations and can be best designed and handled by plant chemists and chemical engineers who are familiar with such problems. Chemical operations on dilute mixed wastes are less familiar to plant chemists and the utilization of the services of experiencedwaste treatment consultants is often advisable. Biological treatment is usually necessary in order to remove soluble and colloidal organic material from wastes. Aerobic biological methods employed for industrial wastes are the same in principle as those used in the treatment of sewage. These include biological lagoons, standard and high-rate or recirculating trickling filters, activated sludge, Including both conventional and high-rate or high-load forms, and sand filters. Two anaerobic methods anaerobic, lagooning and waste digestion, used in industrial waste practice have an exact counterpart in sewage treatment practice. With industrial wastes, aerobic processes often are more heavily loaded than their sewage treatment counterparts, particularly on the basis of pounds of BOD load per unit volume of treatment device. Part of this heavier load is due to the fact that industrial wastes are usually more concentrated than sewage, thus permitting greater treatment efficiency per unit volume. Because of higher concentrations and higher loadings, aerobic treatment units for industrial waste have more complicated oxygen transfer problems. Industrial waste practice utilizes mechanical diffusion of air, with high-speed mixers, high-velocity air, or special devices to promote small bubble formation and the rapid solution of oxygen into the liquid. Those special methods are necessary in order to maintain aerobic conditions in the heavily loaded oxidation units, but this is achieved at the expense of higher power requirement. Anaerobic waste digestion is applicable to concentrated wastes as a means of stabilizing the organic content. Although the biological transformations are the same as those involved in sewage digestion the operationis different in principle. With waste digestion, thesludge remains in the digester as the carrying medium for the organisms that provide the desired biological transformations. The waste passes slowly through the sludge, usually by upflow, and is brought into intimate contact with the biologically active sludge. Digestion can remove upto 90-95% of the BOD at loading that are higher than that possible with conventional aerobic treatment processes. The newer, more heavily loaded aerobic treatment units, particularly activated sludge type processes, have almost eliminated this advantage. Several disadvantages to waste digestion must be considered. The effluent from a digester often requires subsequent aerobic treatment even though it may have a relatively low BOD. Some of the products of digestion, particularly reduced sulfur compounds, create odor problems when the treated waste is finally exposed to the atmosphere. Also, the sulfldes formed during digestion or originally present in the waste are toxic to the biological digestion process. Experience has shown that difficulties may be expected when the total sulfur content of the original waste is over 100 p.p.m. Several problems encountered with the biological treatment of Industrial wastes are not found with domestic sewage treatment. These include toxicity, nutrient deficiencies and adaptability. Toxicity may be overcome in many ways, the best of which is removal of the offending material. If this is not possible, its concentration maybe kept within nontoxic limits by special dilution control. The biota can often be adapted to tolerate previously toxic concentrations of the offending material. This material is then biologically removed by such adapted organisms. Nutritional deficiencies often occur with industrial wastes but never with domestic sewage. The requirements for nitrogen and phosphorus are well established, and these two elements appear to be the most important from a nutritional standpoint. At least when they are present biological activity takes place, and when they are deficient it is reduced. Nitrogen and phosphorus requirements have been established in relation to the BOD and the most commonly accepted ratio is 1 part phosphorus to 3 parts nitrogen to 60 parts BOD. Ratios as high as 1:3:100 have also been used with little effect on biological oxidation rates. Most organic compounds are fortunately subject to biological decomposition but unfortunately not always in the concentrations encountered in industrial wastes. Also, the organism required for a particular decomposition must be naturally available in sufficient numbers to obtain the desired biological seed organisms. On the other hand, digested sewagesludge and manure piles are the best sources for anaerobic biological flora. Usually adaptation and development of a suitable biological population occur simultaneously. Both are accomplished by providing a proper biological environment for the treatment process and then subjecting the original biota to increasing concentrations of the waste, thus gradually developing a population flora adapted to the highest feasible concentration. There are numerous methods of industrial waste processing which are used to eliminate or modify certain waste components in order to facilitate the final disposal of the waste. Such processes as ion-exchange, solvent extraction, evaporation, volatilization, degasification, and selective precipitation are often used to recover materials for reuse within the industry or for the production of a commercial product. Most of these processes are familiar to industrial chemists and engineers and their use in waste treatment practice is not unlike their industrial use. The economical disposal of sludges from industrial waste treatment processes is often one of the most dificult problems encountered. This is also true of sludges from domestic sewage treatment plants, but their problems are often less complex. Sewage sludges are organic in nature and generally subject to biological stabilization by anaerobic digestion. By contrast, industrial waste sludges vary from about 100% organic to 100% Inorganic material and often are not susceptible to digestion because they contain toxic substances or lack sufficient suitable organic material. Relatively few industries produce waste organic sludge suitable for digestion, but the methods of treatment and final disposal for these sludges are similar to those used in sewage treatment practice Typical examples in this category are wastes from the packing house, food processing, antibiotic, and fermentation industries. Sludge conditioning, dewatering, drying, incineration, materials recovery, disposal. The combination of disposal techniques required in a particular situation will depend on many variables. Some of these variables include: (1) the drainability of the sludge and the preconditioning means by which it can be facilitated; (2) thickening and compaction characteristics; (3) organic contentand susceptibility to decomposition. 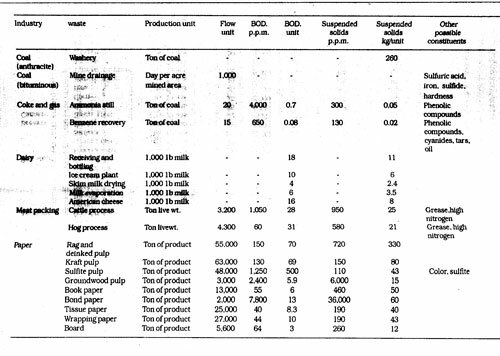 (4) value of the material recovered; (5) availability of suitable land for sludge lagoons, drying beds, and disposal dumps, (6) esthetic considerations (7) continuous or intermittent sludge production; (8) economic considerations initial investment vs. operating costs; (9) availability of suitable dumps or sewage disposal plant sites where joint disposal of municipal and Industrial sludges can be effected; (10) development of users for recovered or processed material; (11) air or stream pollution problems resulting from sludge disposal. Digestion. For organic sludges susceptible to anaerobic digestion, the best methods of disposal usually follows sewage treatment practice. The relatively small amount of organic sludge produced from a single industry seldom warrants the use of such complicated and costly techniques as vacuum filtration and incineration unless land space is at a premium. Open sand-bed drying is generally most applicable for digested sludges with final disposal for fill material or as a soil conditioner. Filtration. Many industrial sludges are susceptible to dewatering by vacuum on pressure filtration. Chemical coagulation with iron, alum, or lime may be helpful and the use of diatomaceous earth filter aids is often found necessary to obtain satisfactory performance. Sludges that are are largely inorganic often filter well without coagulants or filter aids. Since pressure or vacuum filtration is widely used in industrial processes, the method of filtration used for a particular waste sludge problem is often dictated by the experience with filtration within the industry or plant. Several of the factors above influence the choice of filtration equipment. Lagooning. Lagoons may be used in a variety of ways for sludge disposal. Generally they effect the compaction, concentration and storage of either digested organic sludges or inorganic sludge. Some lagoons may be used for dewatering and drying: subsurface drainage mustbe provided in such lagoons and they must periodically be taken out of service. The filled lagoons may be used for final disposal by leaving the sludge in place and possibly covering the surface with earth. Obviously construction of new lagoons is required as old ones are filled. The usual practice in sludgelagoon operation involves removal of the concentrated sludge by hydraulic dredges, draglines, or bulldozers for final disposal on land dumps or soil areas. Lagoons may also be used for digestion of organic sludges in addition to their other disposal functions. When so employed, the lagoon design may be influenced more by the requirements for proper digestion and avoidance of odor nuisances, then by sludge concentration and disposal features. Industrial growth has posed a serious threat of environmental damage. Inspite of stricter pollution control law, there is reluctance on the part of industry for installing/operating pollution control equipment for several reasons: The technologies used by industry for pollution control rely on â€œend of pipeâ€ treatment aimed at reducing pollutants to specified levels. Only primary treatment and secondary biological processes are extensively used for waste water treatment. Industires regard pollution control equipment as â€œcostsâ€ with no returns. Small scale industries, with financial constraints and high cost of pollution control equipment, normally do not install proper pollution control equipment. It meets pollution control standards and statutory requirements. Due to stringent pollution standards, it requires high capital cost and operating cost. There is no recovery of water or solids. Biological treatment results in degradation of chemicals into carbon dioxide, water, ammonia, etc, thereby loss of chemicals. Biological treatment is very sensitive to shockloads and wrt pH, temperature, toxics, etc. It treats effluent at source for water recycle and product recovery thereby treatment scheme becomes economically viable. It givesâ€TM conservation of natural resources and almost total elimination of pollution. It minimises the handling and discharge of effluents. Modern technologies are now available for treating effluents for separation, concentration and recycle thereby product recovery and water reuse. The product recovery and water reuse reduces the operating cost and system becomes economically viable. These technologies can be use when availability of water is scarce. Separation processes such as ultrafiltration (UF), reverse osmosis (RO), speciality ion exchange resins, oil coalescer/skim-mers. Lamella clarifier, continuous filtration systems (Dyna Sand) can be used for water Recycle and products recovery. Ultrafiltration (UF) is a low pressure membrane process for solid-liquid separation. UF system removes water, dissolved salts and solvents from feed streams but retains macromolecules like colloids, proteins, emulsion, pyrogen/bacteria, etc. Indigo-Dye Recovery : Indigo-Dye is used for manufacture of denim cloth. The excess Indigo-Dye is removed by counter-current water rinse. The water rinse solution contains Indigo dye which needs to be concentrated for reuse by ultrafiltration. Ion Exchange (India) Ltd has supplied an integrated water treatment plant and waste water treatment plant (Fig. 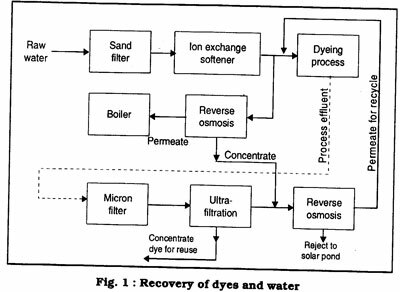 1) using ultrafiltration/ reverse osmosis for recovery of Indigo Dye and water recycle for reuse to a textile mill manufacturing denim cloth. The plant was commissioned in July â€TM92. Fig. 1. Recovery of dyes and water. Fig. 2. 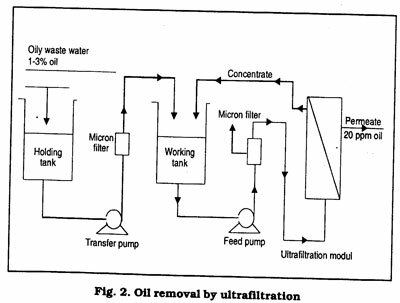 Oil removal by Ultrafiltration. Oil Waste Waters: Stable emulsions particularly water soluble oily wastes, require more sophisticated treatment to meet effluent standards. The chemical treatment results in a sludge, in which dirt, floc and trapped water remain with the oil phase. This sludge always requires further stabilisation before disposal. The water phase from chemical treatment needs additional treatment to meet environmental standards for discharge into a sewer. The Ultrafiltration method produces a water phase that can usually be discharged to sewer with no post treatment and an oil phase can be inciner oil coolant Water (Fig. 2) to the leading automobile industry in western region have proved successful. 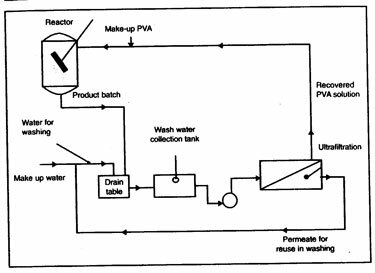 Polyviyl Alcohol (PVA) Recovery from Textile & Chemicals Waste Stream : PVA is used as a sizing agent to improve the strength and surface, characteristics of warp yarns prior to weaving operations. The sizing agent (PVA or CMC) is removed from cloth by scouring before dyeing and finishing operations. Because the synthetic sizing agents are not bio-degradable, they pose a serious problem. Although chemical precipitation of these chemicals is possible, there is sludge disposable problem. Due to the high cost of PVA and CMC, their recovery with Ultrafiltration and use in a much more attractive solution. Ion Exchange (India) Ltd has satisfactorily conducted trials for concentration of PVA solution obtained during washing cycle of polymer beads, an intermediate step for manufacture of ion exchange resins (Fig. 3). Other Ultrafiltration applications are : Electrocoat paint recovery; Pollution control in the paper and pulp industry; Latex concentration/recovery; Solvent recovery; and Starch/enzyme recovery from waste water. Reverse Osmosis is a membrane separation process in which the solvent (water) molecules from a pressurised solution flow through a semi permeate membrane. The membrane acts as abarrier to the flow of solute (dissolved solids) molecules, thereby separating solvent from solute. RO process is generally used for treating brackish water, seawater and waste water to get better quality of water and for drinking water, e.g : Waste water treatment for TDS reduction for water reuse; Concentration and recovery of metals in electroplating rinse water; Vegetable protein recovery; and Cooling water blow-down for water recycle. The increase in demand couple with non-avalability of acceptable quality of water has created challenge to conserve water by recycling effluent after necessary treatment. The location of plants at remote places, away from natural source of water, makes it all the more necessary for conservation and recycling of effluents. Reverse Osmosis (RO) membrane rejects ionic species, colour, organic to make water low TDS water for recylce/reuse. Recovery or waste water depends on the water quality (TDS. silica and other impurities). The cost of RO treated water per cubic meter compares well with the costs charged for fresh water in large metropolitan areas. Ion Exchange (India) Ltd conducted laboratory trials of samples collected for combined effluent treatment plants (CETP). Using RO, a recovery of 75% was obtained for water recycle and reuse. 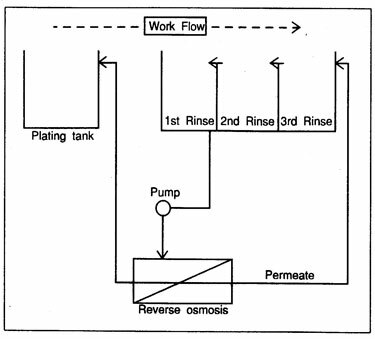 After metal plating, dragout of plating solution from plating tank necessitates rising, which is done most efficiently in a counter current rinse line (Fig. 4). The concentration of metal in the plating tank may vary from 0.5 to 5% whereas the concentration in the waste stream usually varies from 25 to 1.000 mg/1. The metals most commonly encountered are chromium (hexavalent), copper, cadmium zinc, tin and nickel. Many of these metals are plated out of a cyanide solution, which is often encountered in the plating wastes. Conventional effluent treatment nlants treat the olating wastes chemically to reduce hexavalent chromium (Cr+6) to rivalent chromium (Cr+3), to precipitate hy-drated oxides, or chlorination to convert the cyanide to cyanate or nitrogen and carbon dioxide. Fig. 3. PVA recovery by ultrafiltration. Reverse Osmosis is especially suited to operate on the rinse water. The permeate is recycled to the rinse line and the concentrated reclaimed salts are recycled to the plating tank. Ion exchange process is used for effluent treatment and recovery of metals and chemicals and reuse of water, eg Recovery of tartaric acid recovery from waste stream; Formic acid recovery from waste stream of penataerythritol plant; Reactivation of spent chromic acid in electroplating industry; Ammonium salts recovery and con-densate water recycle from condensate of Caprolactum plant; and Recovery of phenol from phenol bearing waste stream. Rotating drum skimmers selectively pickup hydrocarbons andother oil films from the surface of water. The cyclindrical surface is covered with a oleophilic resin. As drum rotates, it picks up the floating oil. 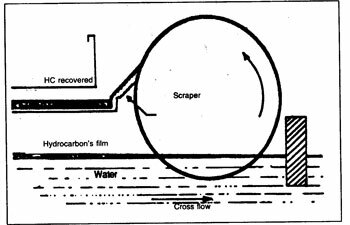 A stationary scraper then recovers the oil from drum surface (Fig. 5). The recovered oil flows into a collecting through. When there is no floating oil on water surface, the drum does not pick up water due to hydrophobic nature of the resin layer. Advantages of drum skimmers are: Continuous recovery of foating oil; Low water content in recovered oil; and it can be installed on existing tank of API separator requiring no modifications. The Oily water emulsion passes through coalescer containing oleophilic resin. The micromic oil droplets of hydrocarbons are first absorbed at the surface of resins, while forming a film around the resin. The droplets coalesce on the oleophilic resins into large droplets which can be separated more easily (Fig. 6) â€" Recovery of hydrocarbons; No moving parts; Very high surface flow rate, hence small floor space requirement; No addition of chemicals, hence no sludge generation and disposal problem; Withstands fluctuations in oil content and flowrate; and Resin performance does not depend on pH of water. This is compact unit for separation of solids from liquids and uses a number of inclined plates. 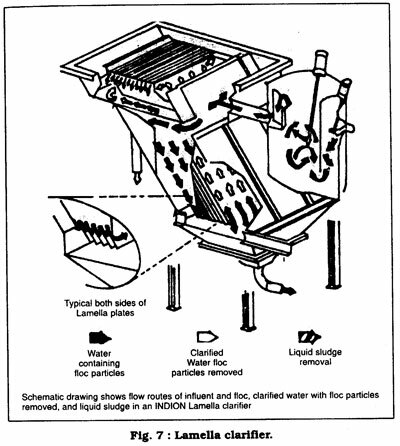 The floor area requirement of a Lamella clarifier is about 1/10th of that required by a conventional clarifier (Fig. 7). Fig. 5. Oil dram skimmer. Synthetic polyelectrolytes are used as coagulants and flocculants for solid liquid separation processes in water/effluent treatment and sludge/sewage treatment. Paper industries produce large quantities of waste water. The problem was to remove suspended and colloidal impurities from the â€˜white waterâ€TM before recycle. Ion Exchange (India) Ltd successfullycompleted site trials to recycle â€˜White waterâ€TM for reuse using polyelectrolytes and Lamella clarifier. demonstrating that these huge quantities of waste water can be easily recycled. Steel mills require huge quantity of water in rolling mills and continuous casting machines. Recirculating water picks up contaminants such as mill scale, suspended solids, and oil/grease. The mill scale is generally removed in scale pit by providing certain residence time. The traces of mill scale, suspended solids and oil/grease can be best removed by employing DynaSand (continuous sand filter). The DynaSand filter can handle SS load up to 200 ppm and oil/ grease upto 20 ppm. The DynaSand filter can be supplied in MS or RCC. 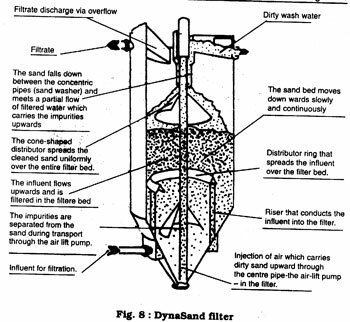 Advantages DynaSand over conventional and filters are : Entire sand bed works as a filtering media in DynaSand as compared to only few top layers in conventional sand filters (Fig. 8). Continuous operation, thereby elimination of backwashing operation; and Wash water requirement is low and it can be recovered using thickener thereby loss can be brought down to 1%, thus 99% water recycle is obtained for rolling mill operations. Ion Exchange (India) Ltd has supplied two plants to steel rolling mills using DynaSand filters for removal of mill scale and recycle of water. It can be seen from this article that new technologies are available for water pollution control with water recycle and/or product recovery. The water recycle and product recovery not only reduce the Operating cost of pollution treatment equipment but also help the industries to conserve scarce resources and preserve natural environment.